By observing sequences of play, Piaget was able to demonstrate that, towards the end of the second year, a qualitatively new kind of psychological functioning occurs. (Pre)Operatory Thought is any procedure for mentally acting on objects. The hallmark of the Preoperational Stage is sparse and logically inadequate mental operations. During this stage, the child learns to use and to represent objects by images, words and drawings. The child is able to form stable concepts as well as mental reasoning and magical beliefs. The child, however, is still not able to perform operations; tasks that the child can do mentally rather than physically. Thinking is still egocentric; the child has difficulty taking the viewpoint of others. It was while marking intelligence tests in the early 1920s at the Grange-Aux-Belles street school for boys, founded by Alfred Binet (developer of the Binet IQ Test), that Jean Piaget first noticed that young children consistently gave wrong answers to certain questions. Piaget did not focus so much on the fact of the children's answers being wrong, but that young children kept making the same pattern of mistakes that older children and adults did not. This led him to the theory that young children's cognitive processes are inherently different from those of adults. 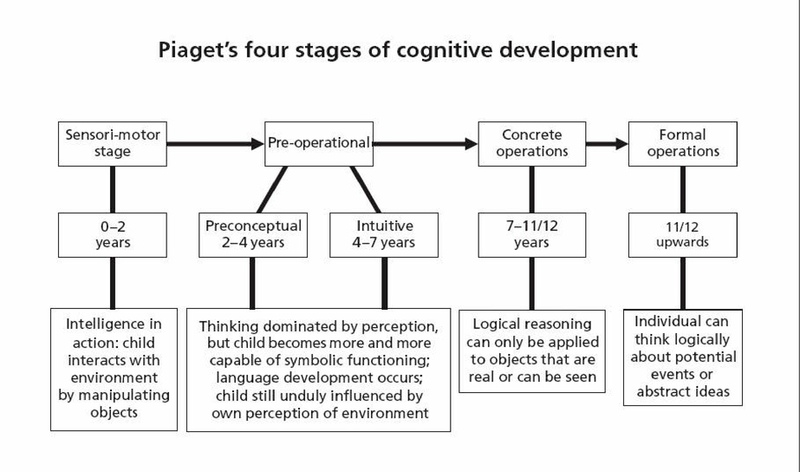 Ultimately, Piaget (1923) was to propose a global theory of developmental stages stating that individuals exhibit certain distinctive common patterns of cognition in each period in their development. His theory proposes that there are four distinct, increasingly sophisticated stages of mental representation that children pass through on their way to an adult level of intelligence. "Co-ordination of sensation and action through reflexive behaviours"
"Coordination of sensation and two types of schemas: habits (reflex) and primary circular reactions (reproduction of an event that initially occurred by chance). Main focus is still on the infant's body." Development of habits. "Infants become more object-oriented, moving beyond self-preoccupation; repeat actions that bring interesting or pleasurable results." "Co-ordination of vision and touch - hand-eye co-ordination; co-ordination of schemas and intentionality." "Infants become intrigued by the many properties of objects and by the many things they can make happen to objects; they experiment with new behaviour." "Infants develop the ability to use primitive symbols and form enduring mental representations." 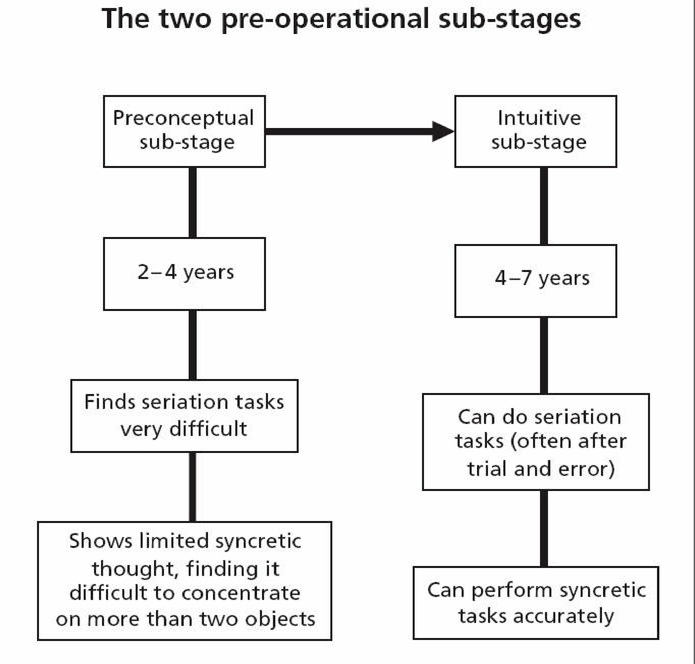 The Pre-conceptual sub-stage occurs between about the ages of 2 and 4. The child is able to formulate designs of objects that are not present. Other examples of mental abilities are language and pretend play. Although there is advancement in progress, there are still limitations such as egocentrism and animism. Egocentrism occurs when a child can’t distinguish between their own perspective and another person's. They tend to pick their own view of what they see rather than the actual view shown to others. Eg: Piaget & Barbel Inhelder’s (1966) experiment in which 3 views of a mountain are shown and the child is asked what a travelling doll would see at the various angles; the child picks their own view compared to the actual view of the doll. Animism is the belief that inanimate objects are capable of actions and have lifelike qualities. An example is a child believing that the sidewalk was nasty and made them fall down. The Intuitive Thought sub-stage occurs between 4 and 7. Children tend to grow very curious and ask many questions; they begin the use of primitive reasoning. There is an emergence in the interest of reasoning and wanting to know why things are the way they are. Piaget called it the Intuitive sub-stage because children realise they have a vast amount of knowledge but don’t know how they know it. In Preoperational thought, centration is the act of focusing all attention on a single characteristic compared to the others. Centration is noticed in conservation: the awareness that altering a substance's appearance does not change its basic properties. Children at this stage are unaware of conservation. They are unable to grasp the concept that a certain liquid be the same volume regardless of the container shape. In Piaget's most famous task, a child is represented with two identical beakers containing the same amount of liquid. The child usually notes that the beakers have the same amount of liquid. When one of the beakers is poured into a taller and thinner container, children who are typically younger than 7 or 8 years old say that the two beakers now contain a different amount of liquid. The child simply focuses on the height and width of the container compared to the general concept. Piaget believes that if a child fails the conservation-of-liquid task, it is a sign that they are at the Preoperational stage of cognitive development. The child also fails to show conservation of number, matter, length, and area as well. Another example is when a child is shown 7 dogs and 3 cats and asked if there are more dogs than cats. The child would respond positively. However when asked if there are more dogs than animals, the child would once again respond positively. Such fundamental errors in logic show the transition between intuitiveness in solving problems and true logical reasoning acquired in later years when the child grows up. Piaget considered that children primarily learn through imitation and play throughout these first two stages, as they build up symbolic images through internalised activity. Studies have been conducted among other countries to find out if Piaget's theory is universal. Patricia Greenfield & Rodney Cocking (1996) reported Greenfield conducting a task similar to Piaget's beaker experiment in the West African nation of Senegal. Her results stated that only 50 percent of the 10-13 year olds understood the concept of conservation. Other cultures such as central Australia and New Guinea have had similar results. There may have been discrepancies in the communication between the experimenter and the children which may have altered the results. It has also been found that if conservation is not widely practiced in a particular country, the concept can be taught to the child and training can improve the child's understanding. Therefore, it is noted that there are different age differences in reaching the understanding of conservation based on the degree to which the culture teaches these tasks. Decentering: where the child takes into account multiple aspects of a problem to solve it. For example, the child will no longer perceive an exceptionally wide but short cup to contain less than a normally-wide, taller cup. Reversibility: the child understands that numbers or objects can be changed, then returned to their original state. For this reason, a child will be able to rapidly determine that if 4+4 = t, t−4 will equal 4, the original quantity. Conservation: understanding that quantity, length or number of items is unrelated to the arrangement or appearance of the object or items. The Formal Operational period commences at around 11-15 years of age (puberty) and continues into adulthood. In this stage, individuals move beyond concrete experiences and begin to think abstractly, reason logically and draw conclusions from the information available, as well as apply all these processes to hypothetical situations. The abstract quality of the adolescent's thought at the Formal Operational level is evident in the adolescent's verbal problem-solving ability. The logical quality of the adolescent's thought is when children are more likely to solve problems in a trial-and-error fashion. Adolescents begin to think more as a scientist thinks, devising plans to solve problems and systematically testing solutions. They use hypothetical-deductive reasoning, which means that they develop hypotheses or best guesses, and systematically deduce, or conclude, which is the best path to follow in solving the problem. During this stage the young adult is able to understand such things as love, ‘shades of gray’, logical proofs and values, etc. The young adult begins to entertain possibilities for the future and is fascinated with what they can be. Adolescents are changing cognitively also in that they think about social matters. Piagetian accounts of development have been challenged on several grounds. First, as Piaget himself noted, development does not always progress in the smooth manner his theory seems to predict. 'Decalage', or unpredicted gaps in the developmental progression, suggest that the stage model is at best a useful approximation. More broadly, Piaget's theory is 'domain general', predicting that cognitive maturation occurs concurrently across different domains of knowledge (such as Mathematics, logic, Physics, language, etc.). However, more recent cognitive developmentalists have been much influenced by trends in Cognitive science away from domain generality and towards domain specificity or ‘modularity of mind’, under which different cognitive faculties may be largely independent of one another and thus develop according to quite different time-tables. In this vein, many current Cognitive developmentalists argue that rather than being domain general learners, children come equipped with domain specific theories, sometimes referred to as 'core knowledge', which allows them to break into learning within that domain. For example, even young infants appear to understand some basic principles of physics (eg: that one object cannot pass through another) and human intention (eg: that a hand repeatedly reaching for an object has that object, not just a particular path of motion, as its goal). These basic assumptions may be the building block out of which more elaborate knowledge is constructed. Additionally, some psychologists, such as Lev Vygotsky and Jerome Bruner, thought differently from Piaget, suggesting that language was more important than Piaget implied.